The Knocks had a year to remember in 2016. The New York duo released their debut full-length album, 55 which reached #4 on Billboard’s Top Dance/Electronic Albums. The album was followed by a tour of Europe opening for Justin Beiber. 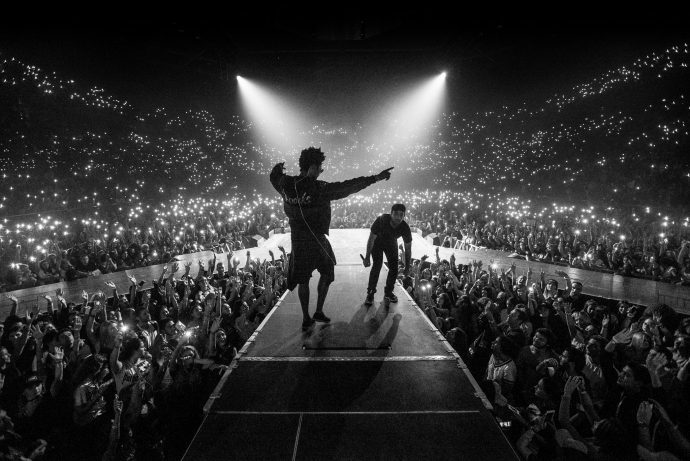 Not one’s to remain stagnant, the Knocks have started off 2017 strong by dropping a new EP called Testify and beginning their own US headlining tour. In the midst of that, they were nice enough to answer a few questions. Last year you toured with Justin Bieber in Europe. What was that experience like? It was crazy and a lot of fun… an experience we will never forget. We played for 20-40k people a night in arenas all over Europe. The fans were really responsive and passionate and we felt that we made an impact on the shows. What’s the craziest tour story you can share? A couple times we got some kids showing up at our hotels or where we were eating… They would see our snapchats etc and recognize where we were and come find us.. The Beliebers do not mess around! How did touring with Bieber affect your songwriting for your new EP, Testify? It affected it in the sense that we were on the road and traveling to these different countries while we were making most of the EP, but a good bulk of the songs were started in NYC and LA. It was a new experience working on music in the green and tour buses. What were the recording sessions for Testify like? All over the place. Some stuff was recorded in LA, NYC, London, Sydney & even a hotel room in Middle America. It was difficult trying to focus on writing when you’re on the road so much, but this was a good test of our ability to improvise and finish music under these circumstances. You have worked with a wide variety of artists from Cam’ron and Wyclef to Carly Rae Jepsen. How do you decide on who to collaborate with? We are super picky with the vocal features on our songs. Whether its CRJ or Wyclef, if the song isn’t good, it doesn’t matter. We won’t just work with someone because it’s a big name. We pride ourselves on concentrating on the bare bones of the song and making sure thats solid. You can dress up any bad vocal with a lot of production tricks but at the end of the day, it’s all about the song. Who is an artist you have not worked with yet but would be a dream collaboration? Finally, you are currently on a headlining tour. How do these sets differ from opening for Bieber? What can fans expect from your live show? They are very different. On the Bieber tour we catered toward a younger/more pop audience. For our headline shows, we play different songs and the energy and style of performance changes. We have a lot of fans that have been coming to shows for years, so we make sure to throw in all our old stuff as well as the new. The set in general is way more of an electronic experience than a pop show.